Ever since I started buying my coffee beans whole and grinding them for my morning coffee I’ve been enjoying coffee even more than ever before. You really can taste the difference. So far I’ve been getting my whole beans ground at the store most of the time and then bring the ground coffee home but as I’m researching manual burr coffee grinders I’m getting to the point where I’m going to be bringing whole coffee beans into the home as well. I will obviously need to find a good way to store them before I grind them which is the purpose of this post. Everyone knows that whole coffee beans stay fresher longer than ground coffee but even in whole bean form roasted beans still go bad, just not as quickly. Air, light, moisture, and heat all contribute to the oxidation process which makes all coffee taste stale if given enough time. Even before the beans are ground. For those people who roast their own beans CO2 is another major problem because the roasting process results in released CO2 from the beans, which can also speed up the decline of the bean’s flavor. For me, I don’t roast and I usually buy beans that are sealed and vented properly from my local roaster Quackenbush. What I need is a good way to move the beans into a vacuum sealed container that protects the beans from all the elements that slowly degrade their quality. I for one like buying in bulk, you usually get a discount but with coffee you can only buy so much because even in the best natural environment the beans freshness won’t last longer than 7-10 days or so. This is what I’m doing. I’ve been using these nice airtight canisters that I got from Gevalia about a decade ago. They’ve been great and they’ve been featured in the background of a number of pictures and videos that I’ve added to this site but after doing plenty of research I’ll be upgrading to the Vacu Vin Coffee Saver which is quite cheap compared to all the fancy stuff. 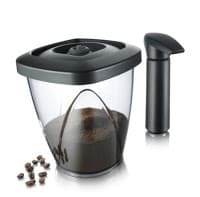 What makes this different is that when you dump your coffee beans into it you then put the lid on and then manually pump the air out of the bin. Most “vacuum” canisters aren’t really vacuum canisters at all – they’re airtight seals yes, but they don’t vacuum. The Vacu Vin has a smoky exterior which blocks most light. It’s airtight and vacuum sealed and if you keep it in a cool location it should be the best way to protect your beans from oxidation for the best price possible. There are some expensive canisters with automatic vacuum pumps but these cost a lot and don’t seem to be any better than this one. I’ve always felt that simpler items were almost always better for longevity and I think that is the case with this item as well. The following video should demonstrate nicely how this device is operated. You’ll probably understand why I like it. It’s manual but it’s really fast and easy to do. In any event there are other options out there but this is my favorite. You can see more on the Vacu Vin over on the product page or check out my list of airtight coffee canisters on the following page. One thing to note, this is not the best way to store coffee beans that were home roasted. You need to use a canister that properly vents CO2 but for store purchased beans coming from a bag that was properly vented I’m confident this is the best method. Does it matter what kind of beans you use for coffee? Of course, it matters. It’s what defines your coffee. The taste, flavor and aroma of your coffee depends on the coffee beans that you will use. In fact, even the origin of coffee beans affect the taste of your coffee. For mild coffees, buy coffee beans that originated from Central American or Island coffees. Coffee beans is like DNA. It holds the character of your coffee. Thus, keeping your coffee beans fresh is important. It can make or break your cup of joe. So before you buy that coffee beans on sale, think about best way to store coffee beans. According to the National Coffee Association, coffee beans are best stored in dry, airtight container, away from sunlight. When choosing a location or container, avoid air, moisture, light and heat. These are the leading enemies of coffee beans. Exposure to these dangers can quickly affect the taste and aroma of coffee beans. Moisture – Too much moisture can cause mold and mildew build up. This will destroy all your coffee beans. 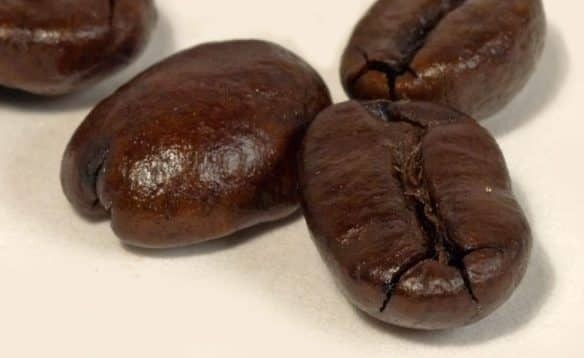 While you can let it air dry, the molds could affect the taste of your coffee beans and the stale-like smell can retain even after you roast it. You can place your coffee beans in a vacuum-seal pack, zip lock or airtight containers to avoid exposure to sudden temperature change and humidity. Temperature – Ideally, coffee beans can be kept at room temperature, which generally falls between 20 and 25ºC (68 to 77ºF). Light levels – Pack coffee beans and store away from direct sunlight. Too much light can cause premature aging and it can lose aroma and flavor faster than expected. Cool, dark places like cupboards, pantries and cabinets are most suitable for coffee storage. Avoid refrigerators. These areas are moist and induces condensation that can lead to coffee beans losing its aroma. Avoid near hot surfaces. Never place coffee beans near oven or stove nor place them near windows where direct sunlight is possible. You can place beans on the countertop but make sure you place it inside an opaque, airtight container. Glass, ceramic or non-reactive metal vessels with airtight lock. If only clear glass is available, keep the glass container inside the cupboard, away from direct sunlight. “Coffee has oils in it and those oils can get rancid. If the oils from the coffee get into the inside of the coffee storage container, they will over time make your coffee vessel smell like rancid coffee smell.” – Peter Giuliano, chief research officer, Specialty Coffee Association. Choose the right kind of container and half of your problem regarding keeping the coffee beans fresh is solved. How long does coffee beans remain fresh? Keeping coffee beans fresh has a lot to do with the kind of coffee beans you buy. Ground coffee usually stays fresh for at most two weeks. After that, it will start to taste flat and stale. Grinding speeds up oxidation of the coffee aroma. Ground coffee should be consumed immediately. If you don’t have a grinder at home, bring just enough coffee beans for a week’s use and the supermarket or a nearby coffee shop to grind the beans for you. Roasted ground beans remain fresh for a month. After that, it will start to lose its aroma and taste flat. Opt of just-roasted coffee beans. Check the roasting date of the beans that you will buy. Green coffee beans last longer. Some coffee experts suggest that green coffee beans can last up to a year if you keep these green coffee beans in a nice, airtight container. Buy just-roasted coffee beans good for two week’s use. Do not buy too much. Resist any call for a roasted coffee beans on sale. If you need to buy more coffee beans, make sure to transfer these beans in an airtight vessel. Have a smaller container that you can refill with ground coffee for use in the morning. Try buying green coffee beans. When stored properly, green coffee beans can last for a year. It’s also easy to roast green coffee beans, let it cool and then grind it for brewing. You will always have great tasting freshly brewed coffee that will be envied by your neighbor. It’s hard not to smell the pleasant aroma of good coffee.